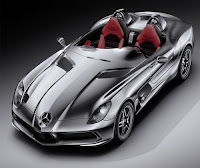 The Exotic car 2010 Mercedes SLR Stirling Moss looks extremely great doesn't it? it's just like an exotic cartoon tough car that came true to life, but too bad not everyone can have one, even if you have a spare million dollars on your pocket you'll still have to own the previous Mercedes SLR before you can avail this 2010 exotic car Stirling Moss, Mercedes made this 2010 SLR specially for their loyalist, which are the ones who bought their previous model so unless you own one, you won't be getting this new exotic car. This is not just a plain new model Mercedes car, it is actually a collectors car because this would be the last to be released big SLR model that has an extreme sports performance which Mercedes made with the Mclaren Formula One race team, and they will limit the production of this Mercedes SLR Stirling Moss to only 75 units, so expect the price of this car to appreciate and be up high with the collectors car in the upcoming future. As for its weird and extreme exotic car design this Mercedes SLR Stirling Moss as you see has no windshield, but it rather have a wind deflector that is just an inch in height, which is specially designed to shield the wind from the driver and passengers face, and as for the roof, this Mercedes SLR gives you a hard tonneau cover that can be opened or stored in the trunk. Mercedes SLR Stirling Moss interior design was made with an objective of light weight, so they've make use of Carbon Fibers in most of the surfaces, and comes with a manually adjusted leather seat with no radio or any of the electronic equipments that adds unnecessary weight to this exotic car. This Mercedes SLR is a rear wheel drive and Inside the hood of this Exotic Car Stirling Moss is a powerful supercharged 5.5 liter V8 engine that is hand built by Mercedes AMG performance division which produces a powerful horsepower of 650 and approximately 605 lb ft of torque that is transmitted through a 5 speed automatic transmission that can also be manually shifted, that enables this Exotic car to sprint accelerate from 0 to 60 mph in just around 3.2 seconds and can reach a top speed of 217 mph.